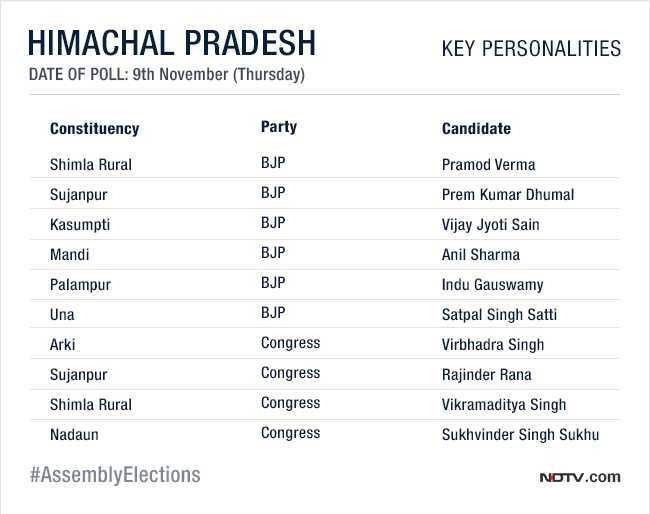 New Delhi: Traditional rivals - the Congress and the BJP - will be locking horns in 68 constituencies in Himachal Pradesh tomorrow. This time, 337 candidates including 62 MLAs are in the poll fray. 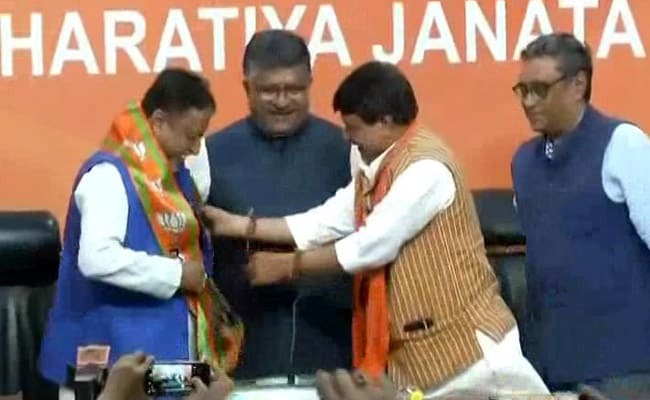 Among the heavy weights are Chief Minister Virbhadra Singh, former chief minister Prem Kumar Dhumal, eight Chief Parliamentary secretaries, Deputy Speaker Jagat Singh Negi, 10 ministers and over a dozen former ministers. A total of 50,25,941 voters are eligible to cast their vote. 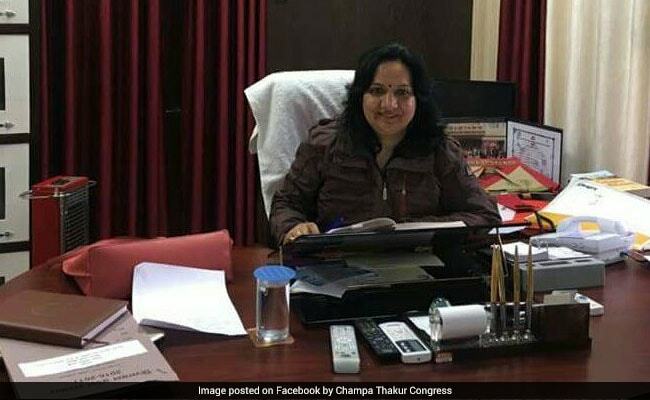 Congress had fielded two independents from Paonta Sahib and Kangra and the BJP has fielded four Congressmen including former minister Anil Sharma and given ticket to on Independent from Chopal. 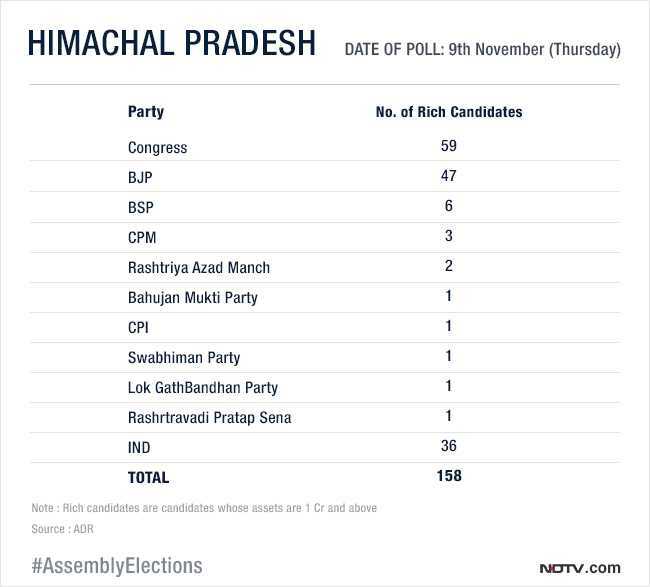 Dharamsala will see 12 candidates pitting against each other, the maximum number of contestants in a constituency. On the other hand, Jhanduta will see a straight contest. Chief Parliamentary Secretary Mansa Ram would be contesting for the 11th straight time from Karsog (SC). 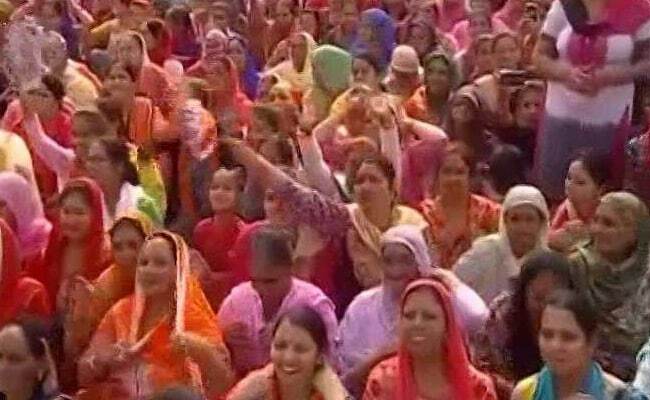 There are 19 women in the poll fray, six from the BJP and three from the Congress and the rest are contesting from various other parties or as independents. Interestingly, Chief Minister Virbhadra Singh has changed his constituency to Arki, to make way for his son Vikramadita Singh and former chief minister PK Dhumal too has changed his battleground to Sujanpur this year. While The BJP went all guns blazing at the Congress, hitting the Chief Minister Virbhadra Singh for corruption, the Congress took them on over the issues of GST and demonetisation. 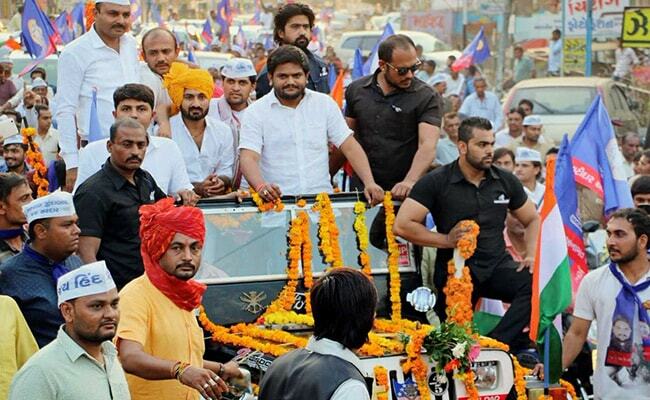 The 12 days of campaign were electrifying and saw over 450 rallies by the campaigners. 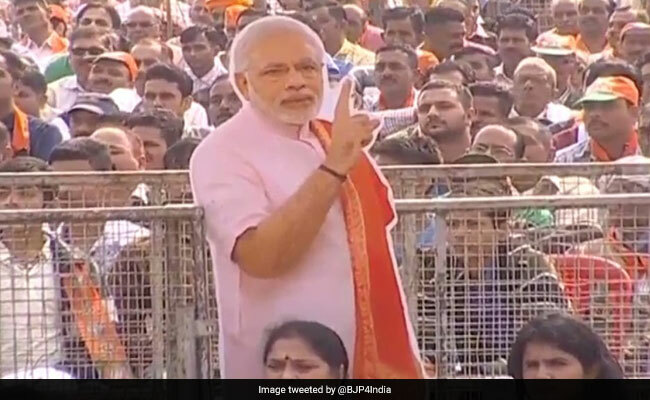 While Congress Vice President Rahul Gandhi addressed three rallies, Prime Minister Narendra Modi addressed seven rallies and BJP chief Amit Shah too pitched in for six rallies to sway the voters of the hill state to their side. 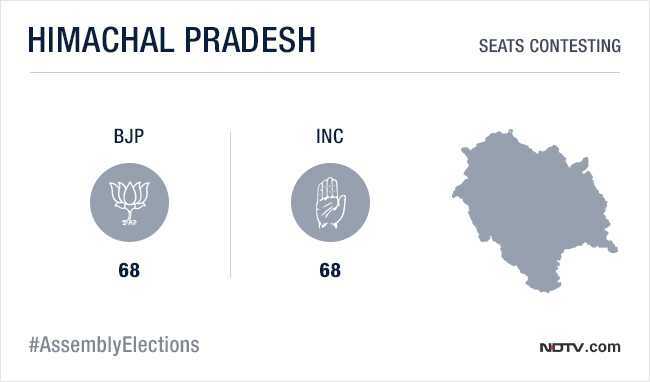 Apart from the arch rivals - the BJP and the Congress, which are competing on all 68 seats, the BSP is contesting on 42 seats, followed by the CPI(M) which has fielded 14 candidates. Swabhiman Party and Lok Gathbandhan Party have fielded six candidates each and there are three candidates from the CPI. The Election Commission today barred exit polls related to Himachal Pradesh and Gujarat assembly elections starting 8 am on November 9 till 6 pm on December 14. Invoking its powers under Section 126A of the Representation of People Act, 1951, the poll panel has barred exit poll in connection with the two state assembly elections between the notified period. 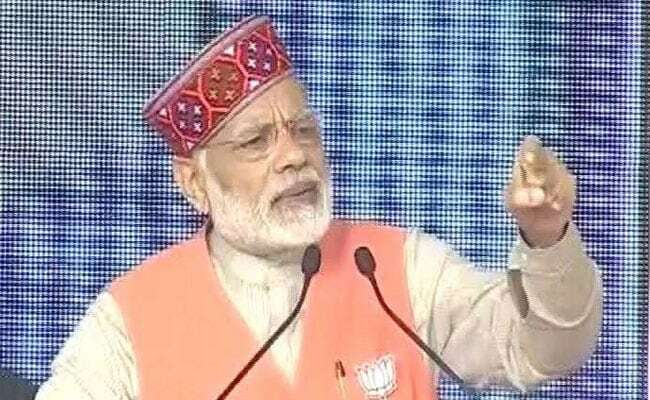 Voting in Himachal Pradesh is scheduled to be held in a single phase on November 9 while in Gujarat, voting will be held in two phases on December 9 and 14. The Congress and the BJP are returning to power alternately since 1985. There are 50,25.941 voters in the state including 25,31,321 men and 24,57,032 women. 338 candidates will try their luck in the assembly election scheduled for November 9. Along with Chief Minister Virbhadra Singh, 10 ministers, eight Chief Parliamentary secretaries have thrown their hat in the ring. Virbhadra Singh is a six-time chief minister in Himachal Pradesh, while Prem Kumar Dhumal has held the post twice. The two have taken turns at the helm of the state from 1993. Virbhadra Singh will be fighting for the Arki seat, after giving the ticket for the Shimla rural seat to his son Vikramaditya Singh, who will be contesting the election for the first time. 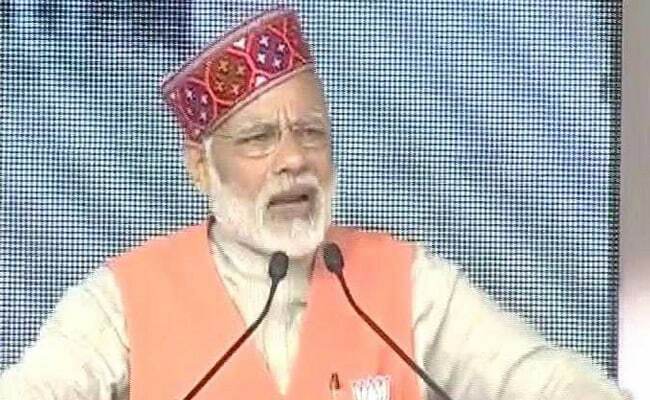 Himachal Pradesh will go to elections on November 9, with the polls expected to be a two-way battle between the incumbent Congress government and the BJP. 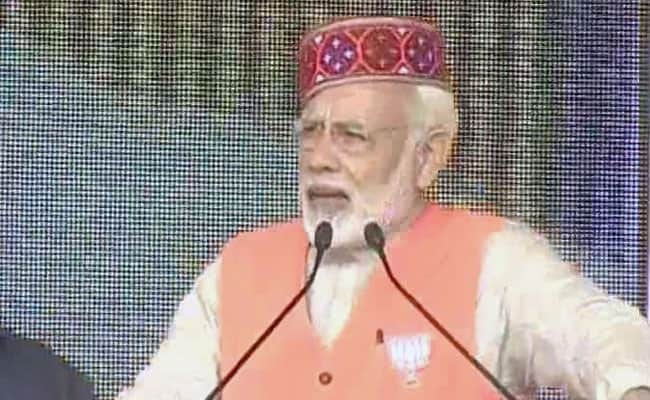 Congress announced veteran Virbhadra Singh as their chief ministerial candidate, while BJP recently announced that Prem Kumar Dhumal will lead the party in Himachal Pradesh. 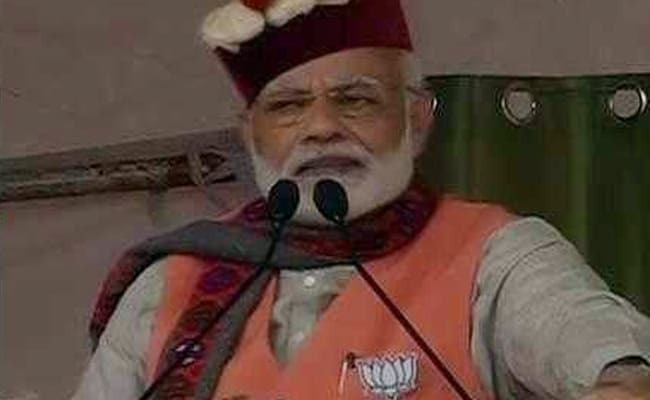 More than 50 candidates contesting the Himachal Pradesh assembly elections have criminal cases pending against them, with the highest number belonging to the Bharatiya Janta Party. Congress Vice President Rahul Gandhi today drew an analogy with the Pandava-Kaurava tussle in the epic Mahabharata and said that the fight between his party and the BJP in Gujarat was one between "truth and lies", where the truth lay on the Congress's side. 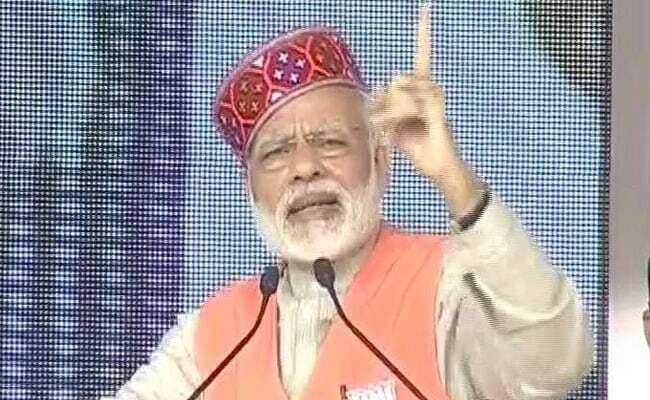 He also said that while the Prime Minster was armed with his "government, police, army, governments in Gujarat, Uttar Pradesh, Madhya Pradesh, Chhattisgarh", he had truth on his side "and we need nothing other than truth". Hardik Patel blinked today, saying he will support the Congress in the December elections in Gujarat, since the party is "openly supporting Patidars." 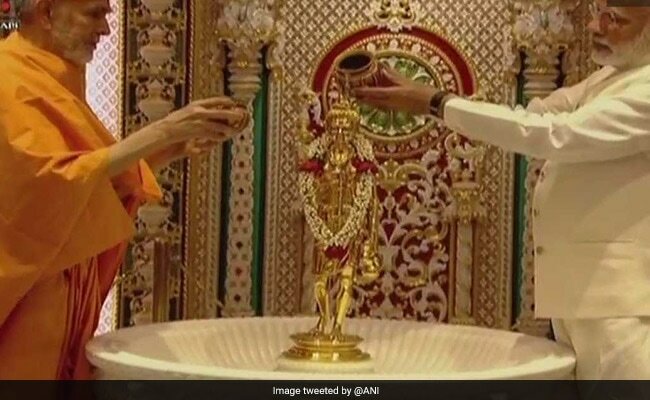 Describing the Akshardham Temple as beautiful and ahead of its times, Prime Minister Narendra Modi said that even though people may not enter the temple as 'Bhakts' they would definitely leave as one. 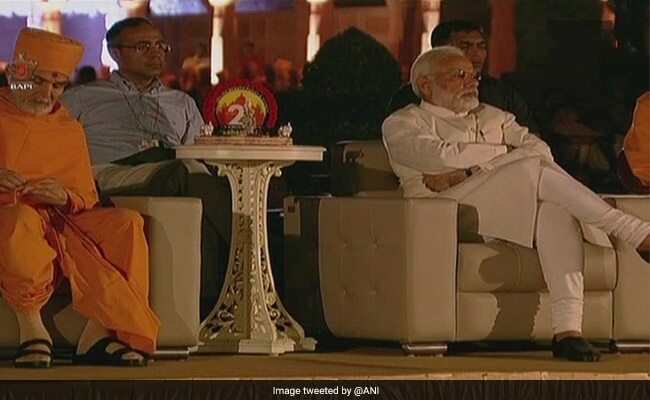 Prime Minister Modi also enjoyed some cultural programmes that were organised at the Akshardham temple on its silver jubilee. PM Modi's Akshardham visit was announced by the Bochasanwasi Shri Aksharpurushottam Swaminarayan Sanstha (BAPS). 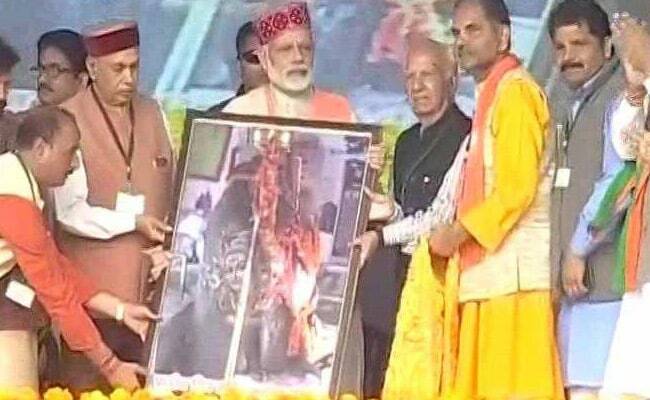 In April this year, the prime minister had paid an emotional tribute to spiritual guru and head of BAPS of Swaminarayan sect Pramukh Swami who died at the sect's temple in Sarangpur in Botad district. PM Narendra Modi reaches Akshardham temple in Gandhinagar for silver jubilee celebrations. Himachal Pradesh is at the crossroads where it must ensure that no corrupt 'Hand' can stake a claim in Himachal's rights. Someone born in a family which has ruled for decades doesn't believe his own Army and agencies? Instead, meets China's envoy and asks about Doklam. Drug mafia - one that ruins our youth and casts a shadow on the state's bright future... takes away the dreams of children and parents alike... I appeal to all mothers... vote correctly.. you give birth to Vir Purush's (brave men), not drug addicts. 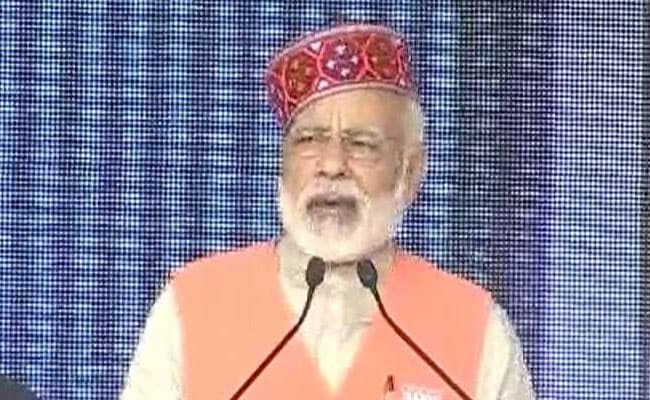 People watching PM Modi speaking in Rehan of the Kangra district in poll-bound Himachal Pradesh . Would even a child in Himachal believe that the Congress has "zero tolerance" to corruption?